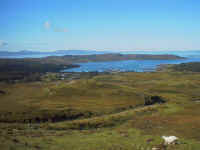 During the whole of the 15th century the Clanranald had been engaged in feuds regarding the lands of Garmoran and Uist; first, with the Siol Gorrie, or race of Godfrey, eldest brother of Ranald, the founder of the tribe, and afterwards with the Macdonalds or Clanhuistein of Sleat, and it was not till 1506, that they succeeded in acquiring a legal title to the disputed lands. John, eldest son of Hugh of Sleat, having no issue, made over all his estates to the Clanranald, including the lands occupied by them. Archibald, or Gillespock, Dubh, natural brother of John, having slain Donald Gallach and another of John's brothers, endeavoured to seize the lands of Sleat, but was expelled from the North Isles by Ranald Bane Allanson of Moydart, eldest son of the chief of Clanranald. The latter married Florence, daughter of MacIan of Ardnamurchan, and had four sons - 1. Ranald Bane; 2. Alexander, who had three sons, John, Farquhar, and Angus, and a daughter; 3. Ranald Oig; and 4. Angus Reochson. Angus Reoch, the youngest son, had a son named Dowle or Coull, who had a son named Allan, whose son, Alexander, was the ancestor of the Macdonells of Morar. In 1509 Allan Macruari was tried, convicted, and executed, in presence of the king at Blair Athol, but for what crime is not known. 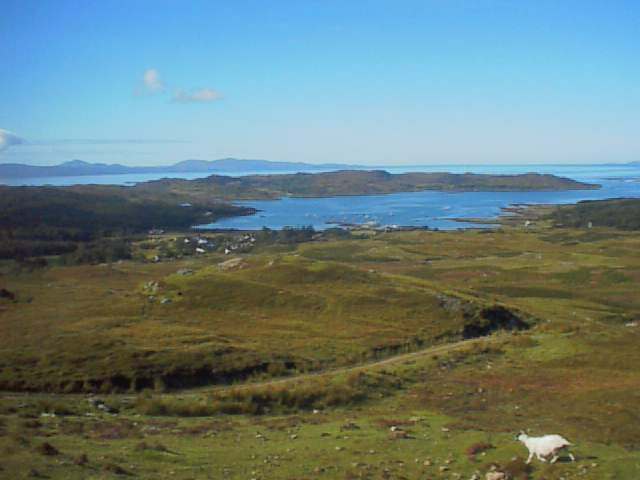 His eldest sons, Ranald Bane, obtained a charter of the lands of Moydart and Arisaig, Dec. 14, 1540, and died in 1541. He married a daughter of Lord Lovat, and had one son, Ranald Galda, or the stranger, from his being fostered by his mother's relations, the Frasers. On the death of Ranald Bane, the fifth chief, the clan, who had resolved to defeat his son's right to succeed, in consequence of his relations, the Frasers, having joined the Earl of Huntly, lieutenant of the north, against the Macdonalds, chose the next heir to the estate as their chief. This was the young Ranald's cousin-german, John Moydartach, or John of Moydart, eldest son of Alexander Allanson, second son of Allan Macruari, and John was, accordingly, acknowledged by the clan captain of Clanranald. Lovat, apprised of the intentions of the clan against his grandchild, before their scheme was ripe for execution, marched to Castletirrim, and, by the assistance of the Frasers, placed Ranald Galda in possession of lands. The Clanranald, assisted by the Macdonalds of Keppoch and the Clan Cameron, having laid waste and plundered the districts of Abertarf and Stratherrick, belonging to Lovat, and the lands of Urquhart and Glenmoriston, the property of the Grants, the Earl of Huntly, the king's lieutenant in the north, to drive them back and put an end to their ravages, was obliged to raise a numerous force. He penetrated as far as Inverlochy in Lochaber, and then returned to his own territories. The battle of Kinlochlochy, called Blar-nan-leine, "the field of shirts," followed, as related in the account of the clan Fraser. The Macdonalds being the victors, the result was that John Moydartach was maintained in possession of the chiefship and estates, and transmitted the same to his descendants. On the return of Huntly with an army, into Lochaber, John Moydartach fled to the Isles, where he remained for some time. The Clanranald distinguished themselves under the Marquis of Montrose in the civil wars of the 17th century. At the battle of Killiecrankie, their chief, then only fourteen years of age, fought under Dundee, with 500 of his men. They were also at Sheriffmuir. In the rebellion of 1745, the Clanranald took an active part. Macdonald of Boisdale, the brother of the chief, then from age and infirmities unfit to be of any service, had an interview with Prince Charles, on his arrival off the island of Eriska, and positively refused to aid his enterprise. On the following day, however, young Clanranald, accompaiied by his kinsmen, Alexander Macdonald of Glenaladale and neas Macdonald of Dalily, the author of a Journal and Memoirs of the Expedition, went on board the prince's vessel. and readily offered him his services. He afterwards joined him with 200 of his clan, and was with him throughout the rebellion. At the battles of Preston and Falkirk, the Mcdonalds were on the right, which they claimed as their due, but at Culloden the three Macdonald regiments of Clanranald, Keppoch, and Glengarry, formed the left. It was probably their feeling of dissatisfaction at being placed on the left of the line that caused the Macdonald regiments, on observing that the right and centre had given way, to turn their backs and fly from the fatal field without striking a blow. At Glenboisdale, whither Charles retreated, after the defeat at Culloden, he was joined by young Clanranald, and several other adherents, who endeavoured to persuade him from embarking for the Isles, but in vain. In the act of indemnity passed in June 1747, young Clanranald was one of those who were specially excepted from pardon. The ancestor of the Macdonalds of Benbecula was Ranald, brother of Danald Macallan, who was captain of the Clanranald in the latter part of the reign of James VI. The Macdonalds of Boisdale are cadets of Benbecula, and those of Staffa of Boisdale. On the failure of Donald's descendants, the family of Benbecula succeeded to the barony of Castletirrim, and the captainship of the Clanranald, represented by Reginald George Macdonald of Clanranald. From John, another brother of Donald Macallan, came the family of Kinlochmoidart, which terminated in an heiress. This lady married Colonel Robertson, who, in her right, assumed the name of Macdonald. From John Oig, uncle of Donald Macallan, descended the Macdonalds of Glenaladale "The head of this family," says Mr. Gregory, "John Macdonald of Glenaladale, being obliged to quit Scotland about 1772, in consequence of family misfortunes, sold his Scottish estates to his cousin (also a Macdonald), and emigrating to Prince Edward's Island, with about 200 followers, purchased a tract of 40,000 acres there, while the 200 Highlanders have increased to 3000. " One of the attendants of Prince Charles, who, after Culloden, embarked with him for France, was Neil MacEachan Macdonald, a gentleman sprung from the branch of the Clanranald in Uist. He served in France as lieutenant in the Scottish regiment of Ogilvie, and was father of Stephen James Joseph Macdonald, marshal of France, and Duke of Tarentum, born Nov. 17, 1765; died Sept. 24, 1840. A Highland Chieftain yesterday made an emotive plea for planning authorities to permit the renovation of his clan's ancestral home. For more than 250 years Castle Tioram - once the mainland stronghold of the powerful Clanranald - has lain in ruins. Legend has it that the imposing mediaeval fortress was torched by clan members during the Jacobite uprising to prevent it falling into the hands of the invading English. Now ambitious proposals have been finalised to restore the castle. But although the plans are to be submitted for official consideration next month, conservationists have already voiced their opposition, believing the castle should be left in ruins. Last night the 24th chief of the Clanranald, Captain Ronald MacDonald argued that the restoration must go ahead. He said: "Castle Tioram is extremely important for members of my clan the world over. There are hundreds of thousands of clan members out there, in dozens of different countries. "There are very few who do not cherish their Highland heritage. It gives them a certain support wherever they may be. These people would be thrilled to know that Castle Tioram is being given a new lease of life". Built in the 13th century, the castle towers above Loch Moidart in the West Highlands. It was finally destroyed by fire in 1715. Folklore has it that the blaze was deliberately started onthe orders of the castle's occupant, Allan of Clanranald, to discourage Hanoverian troops from taking possession. One later historian reports that the henchman commanded to torch the castle was initially reluctant, but eventually conceded declaring: "I shall never come back again and it is better that our old family seat should be given to the flames than forced to give shelter to those who are about to triumph over our ruin". Despite its delapidation, Castle Tioram remained in the hands of the Clanranald until early this century when it was sold to foreign owners. Put up for sale again by its absentee American landlords in 1997 for £100,000, it was bought by Scottish air charter millionaire Lex Brown, who immediately announced an ambitious and controversial plan to re-roof the castle with a view to making it his home. The new plans to restore the castle as closely as possible to its 17th century splendour - at a cost of £3million - will be passed to Highland Council next month. In addition to routine planning permission, the project requires Sheduled Monument Consent from Historic Scotland, who have signalled disapproval. The Clanranald Castle Tioram Trust, a community ownership trust which failed in a bid to buy the property, argues it would be wrong to convert the historic monument. Spokesman Dr Michael Foxley believes it should be left a ruin. He said: "For almost 300 years it has stood clearly as a burnt-out shell and as a statment to what was effectively the lordship of the isles and the Clanranald empire. Lex Brown was not available for comment last week but spokesman Iain Crawford said "The castle needs substantial resources to be spent to prevent it deteriorating".